I had this easy peasy Shrimp Dip Recipe at a friend’s house over the holidays and it was the bomb! I love stumbling upon a recipe via a friend of a friend of a friend, and having it be something is SO easy that it is very easy to replicate. This super simple Shrimp Dip recipe is just such an easy recipe, and it is the perfect dip to bring to any game day event, or to serve at your next game day party. And dip recipes can make a party. I’m a snacker, so whenever I’m at a party you can find me by the food grazing. Give me a Spinach Artichoke Dip or Tangy Onion Dip and I’m a happy camper. I actually went to the grocery store with NO shopping list. What was I thinking? Besides ingredients for the game day recipe that was on my meal plan for the football game. Here’s what you need for my Gluten-Free Shrimp Dip game day recipe. Cream cheese, Hoffman House shrimp sauce, salad shrimp, and Blue Diamond Almond Nut-Thins nut and rice cracker snacks. Now… you could easily used any other type of cracker if you’re not concerned about the gluten, but all the other ingredients just happen to be gluten-free anyway. It was super easy to make this party dip a gluten free party food. And, it is PERFECT for the big game day. Shrimp Dip is also easy to throw together. All you need to do is let the cream cheese soften on the counter top, and then smooth it down in a shallow pie dish. Top that with the jar of shrimp sauce. Then, defrost salad shrimp in a bowl of cool water and then set on a paper towel to absorb excess water. Toss the shrimp over the cocktail sauce and then tuck crackers along the edge of the pie plate. This appetizer recipe is so easy to make and even easier to eat. It’s a crowd-pleaser. And a game-changer. Because, trust me… this will be a staple appetizer for any game day celebration we host or attend ever again. Soften cream cheese at room temperature. Spread over bottom of shallow pie plate. Top with shrimp sauce. Defrost shrimp in a bowl of cool water, drain water, and then put shrimp on paper towel to soak up excess water. 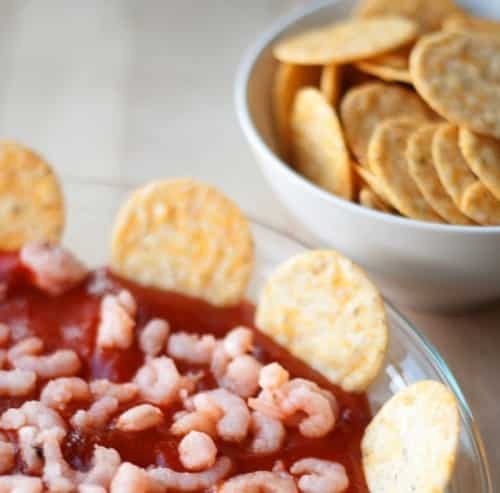 Top shrimp sauce with shrimp and then tuck crackers into the dip along the edges of the pie plate. Such a classy little dip but ever so easy:)) Totally deliciousness!!! Thanks so much Evelyn! 🙂 Have a great weekend. Thanks Jeanie! So glad you came to visit. Come back by on Tuesday evenings and link up with us on Wonderfully Creative Wednesdays- food or creative posts welcome! That looks so good. I am finally starting to follow my gluten free diet. When I was first told to go GF, the food was horrible. It has improved so much over the years and I am so grateful! I can not wait to try this out on the big game day. We love shrimp and this looks really good! My family would love this, especially with tiny shrimp. I love shrimp and it is a good idea for my snacks.